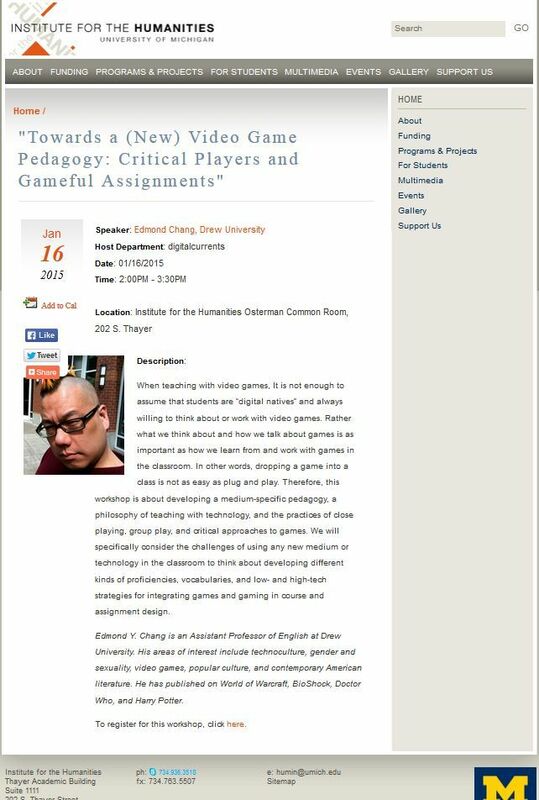 I will be presenting a workshop on teaching with video games at the Institute for the Humanities at the University of Michigan on January 16, 2015. The talk is part of their Digital Pedagogy Workshops and Digital Currents series and is titled “Towards a (New) Video Game Pedagogy: Critical Players and Gameful Assignments.” Though it will be very cold, I am looking forward to visiting Michigan again and to talking with graduate student instructors about teaching, technology, and games in the classroom. Many thanks to Patrick Tonks, the Institute, and Michigan for the invitation and support. This entry was posted in #secondyearfaculty, Events, Gaming, News, Teaching and tagged digital pedagogy workshop, invited presentations, teaching with video games, University of Michigan. Bookmark the permalink.